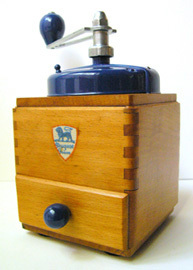 In this month’s issue of Wood News, David Brearley of Austin, TX shows us the method he has used to restore and refinish a number of vintage coffee mills he has found. Given the often inseparable relationship between woodworkers and their coffee, we can see how these two topics might go together so well! Take a look at David’s process, and some of the beautiful vintage coffee mills he has restored in his article in this month’s issue of Wood News. Click here to read the July issue of Wood News. About 21 minutes ago from Highland Woodworking's Twitter via Hootsuite Inc.